Tags: Stephen Chidwick, US Poker Open. 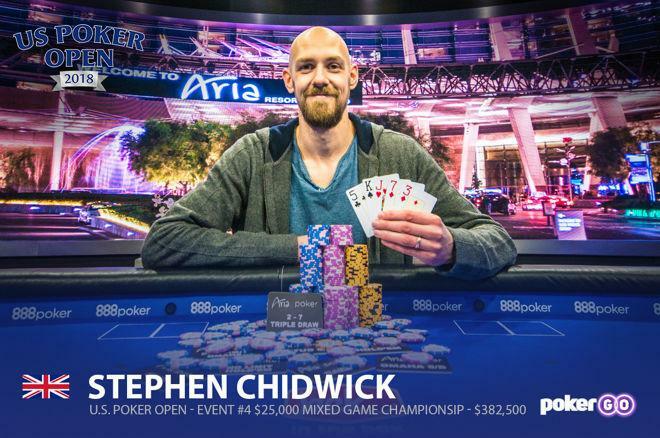 British poker pro Stephen "stevie444" Chidwick is definitely on a roll at the US Poker Open as he took down his second US Poker Open high roller event in just two days to pocket another six-figure payout and stick his name at the top spot in the US Poker Champion leaderboard. The inaugural US Poker Open 2018 high roller series is currently scheduled at the Aria Resort & Casino in Las Vegas. This particular poker festival has attracted well-known poker pros from all over the globe, and it could be said that since the start of the series last week, Chidwick has performed extremely well among his fellow opponents. Chidwick won Event #3 on February 5 Monday. On to the next tournament, he was already running late at the registration, since he has to spend quite a bit of time, of course, when he won the previous event. February 6 Tuesday evening, he bested all the players of the $25,000 Mixed Game Championship, a tourney that calls for not only one's excellence in No-Limit Hold'em poker, but also in seven other game types. Besides Chidwick, this particular event attracted some of the most prominent high stakes players, including the likes of Phil Hellmuth and newly-sponsored partypoker ambassador Isaac Haxton. Hellmuth actually made his first ever appearance in this series when he joined in the Mixed Games event, but it seemed that this particular title was not meant for him as he was eliminated in sixth place for $67,500. Still, not bad for his first time at the US Poker Open. The mixed event's official final table was played Tuesday evening at the Aria casino. At the start of the final table, Isaac Haxton was the chip leader holding 2.317 million, which definitely is a huge advantage over his other opponents. At that time, Stephen Chidwick was third in chips with a total of 1.08 million. After some time, only three players remain: Haxton, Chidwick and Chris Vitch. An unfortunate turn of events led to Haxton, who many believed would be the winner considering he had the upper hand at the beginning of the final table, leaving in third place for $167,750. In the end a 2-7 Triple Draw hand forced Vitch all-in. He finished second place for $247,500. Chidwick's payout was $382,500. Combined with his previous cashes from the US Poker Open, he now has $810,900 and stands on top of the US Poker Champion lineup. The one who wins the most money from the inaugural edition of this high roller series shall be crowned the US Poker Champ and will receive a special trophy in remembrance of their triumph and performance. EPT Barcelona High Roller: Another Record Has Been Set! 9 comments for "Stephen Chidwick wins Back-to-Back at US Poker Open"
great results for this player stephen chidwick. It's not easy to play against heavy names in the poker industry. It remains to be seen what he will do in the next live tournaments. Many congratulations for the good games made by this professional poker player. Congratulations to Stephen Chadwick on winning his second title in a row at US Poker Open. It's a pleasure to me that he had won his second at 8-game tourney, as I love mixed games very much. I'd like to meet him at the table once. A nice lead at the top of the leaderboard there for Stephen. Let's hope he keeps it going and wins the whole thing that'll be one for the Brits. A massive well done to Stephen Chidwick for winning the USPO high roller event not once, but twice. He is definitely one of the best live poker players. He is only 28 years old and his future looks promising. This is what you not only call a good player but a lucky player also. if lady luck is not on your side. Great boost with those winnings.